UPR's Designer Style Billet A/C Knobs for the 2005-2006 Mustang replace the factory plastic A/C knobs and offer a style much like the factory dash buttons. 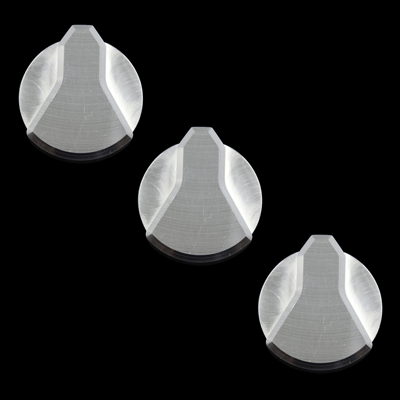 These new knobs have the same type of concave surface machined into them as the factory dash controls making it more factory like in appearance as well as giving you the billet look we are well known for creating. Crafted to fit & function better than an OEM part, while giving you the bold clean styling of our aftermarket Dress Ups for your American Muscle Car. 2005 2006 GT GTS Mustang Cobra Shelby Roush Saleen & Steeda Vehicles. Does NOT fit 2007 2008 2009 Mustangs. See our line of Billet A/C Knob Covers for these years. No one else can stack up to the bold clean styling of our aftermarket Billet dress ups, Street Strip & Racing Suspension & Performance Parts for your late model American Muscle Car!